Well guys as we all know there are lots & lots of performance cars on the market now days to choose from. And in my case I have had a lot of cars over the years in many-many brands and did enjoy them for sure. I want a car the size of our Golf R sedan. I am never-ever having another large car Coupe or Sedan I'm over those. So, as I take all the available cars into consideration the RS3 ALWAYS fits my wants, desires, needs PERFECT !!! I totally understand others though that are Fed-Up with the WAITING and the ****-Poor-Communication from Audi. and picked the most loaded-up 2018 RS3 and bought it. Flew to wherever it was and drove it back home. 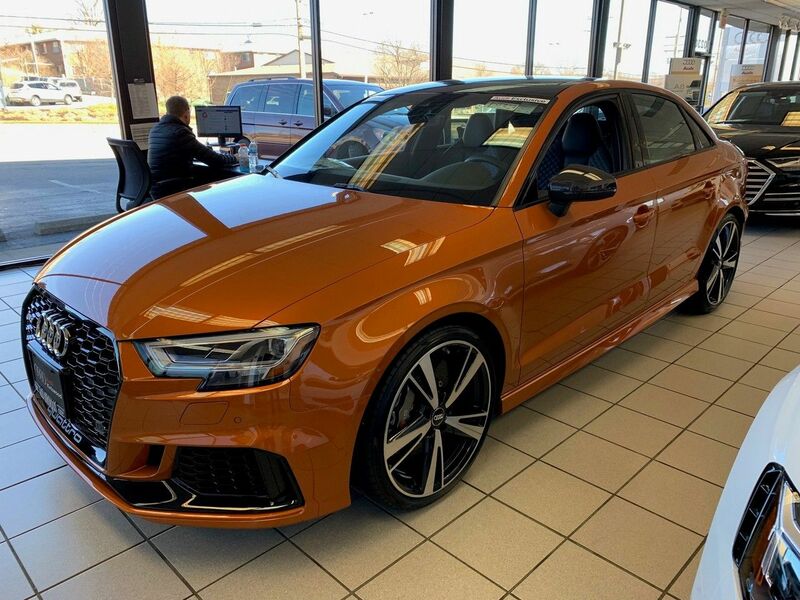 And I did locate a 100% Loaded-Up 2018 RS3 with even a Custom Color, Brand-New on the Show-Room-Floor. Seems it was like $72,000.00 US Dollars. Anyway, fellows this is and has been overly tiring to you guys for sure. I found that 2018 RS3 I spoke of above. Last edited by tigerhonaker; 03-07-2019 at 07:01 AM. I cannot imagine any additional Tariffs but as you say if that did take place and they were 20% I would then have to probably CANCEL my RS3. I'm a more positive thinking fellow though and I really just don't see anything like that happening. It would be so very-very-very NICE though if Audi would simply Step-Forward and ANNOUNCE to all their Audi US Dealerships that they have finally started the 2019 RS3 production. That's really what I would be so pleased with seeing either watching a video on You-tube or from my local Audi Dealership. Posted in this in another thread, but I figured I would post it here too. Just wanted to add my ordering experience so far and what my dealer has recently told me. 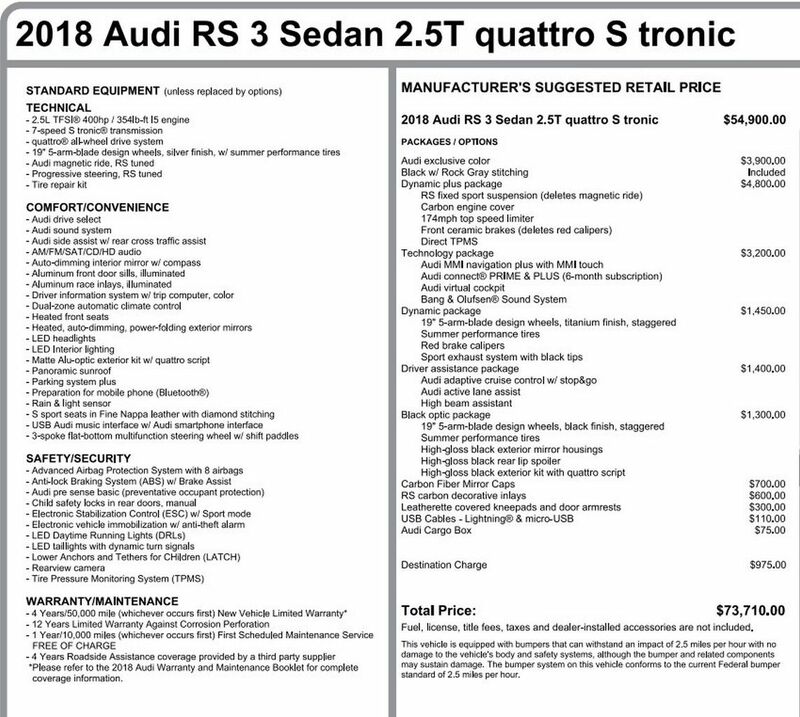 I put an order for my 2019 RS3 on Nov 18th of last year. It has still not been put into production week. I reached out to my dealer and he told me there are 52 RS3s in California that are still not in production and only 8 so far have been produced and are in transit. Their factory rep will reach out to me later this month and I'll hopefully get a better update. Keep up the good wait gentlemen! It will all be worth it. That was my main Thread you also posted on. Looks like late May/early June for me. Interestingly, the status sheet still shows Holds Type: Distribution. Thanks for posting your Up-Dated information buddy. Looks like you are in the Driver's seat come June 2019 !!! If this actually happen then I would for sure cancel my order and get a X3M which will be produced in the US factory from what I can tell. Should arrive to the dealer 10-15 days after this. I would ask for the full status sheet. If you have a build week assigned, I would think production should be solidified.